Every April 23rd, the streets of my city, Barcelona, fill with red roses and book stands, for a celebration steeped in history. Have you heard about Sant Jordi Day? It’s one of the most beautiful festivals in Catalonia and the most romantic…. The post Dragons, books and roses: how to celebrate Sant Jordi Day appeared first on Hostelworld Blog. The post The 8 best hostels in Lima, Peru appeared first on Hostelworld Blog. The post The 10 best hostels in Havana for backpackers appeared first on Hostelworld Blog. 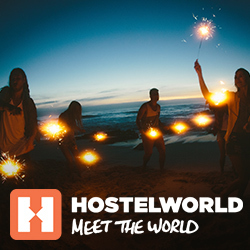 The post The best hostels in Spain for every backpacker appeared first on Hostelworld Blog. The post The 6 best hostels in Santorini for every backpacker appeared first on Hostelworld Blog. The post 10 tips for getting that – very needed – sabbatical appeared first on Hostelworld Blog. The 5 Best Hostels in Ibiza! The post The 5 Best Hostels in Ibiza! appeared first on Hostelworld Blog. The post The 10 best hostels in Buenos Aires appeared first on Hostelworld Blog. The post The 7 best hostels in Cartagena appeared first on Hostelworld Blog. The post The 10 best hostels in Mexico City appeared first on Hostelworld Blog.